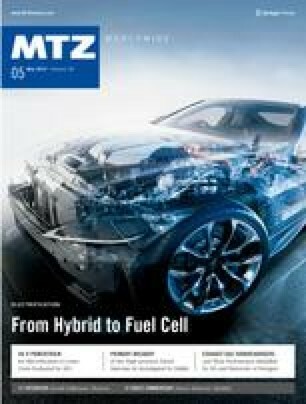 To further develop fuel cell technologies for automotive applications, Magna Steyr, Proton Motor, HyCentA and the Institute for Powertrains and Automotive Technology at the Vienna University of Technology have integrated a fuel cell range extender system into a compact van with battery-electric drive. This article describes various topics, including the fuel cell system and its thermal management as well as the operating strategy of the vehicle. Battery electric vehicles provide an attractive alternative to the internal combustion engine propulsion if they are combined with a fuel cell. There are no toxic emissions, as the hydrogen fuel is solely converted to water. The electricity stored in the battery and generated by the fuel cell is used to supply electric power to an electric traction motor, that also provides some advantages regarding the dynamic behaviour and drivability compared to the internal combustion engine. Special thanks to the Austrian Ministry of Innovation and Technology (BMVIT) for financially supporting this research project in the course of the "mobility of the future" program. The authors would also like to thank Dipl.-Ing. (FH) Knut Schiefer of Proton Motor for the valuable collaboration and the successful project implementation.